Bedding/Cages: It is important that your gerbil has enough room to move around freely in its habitat. Gerbils have been known to chew on wire cages, leaving them with scratched, bloody noses. The best option for a gerbil is a covered aquarium or a large plastic bin with air holes. Gerbils are con-artists, and can escape from almost any type of Habitrails or tubed cage. Gerbils can also jump about two feet in the air, so your cage needs to be completely covered. Kaytee Clean & Cozy bedding is used here at Ohana Gerbils, however, Carefresh is also a great non-allergenic brand. Never use cedar or pine bedding. The wood in these types of beddings are extremely dangerous to gerbils, and can cause liver and respiratory damage. Never use any scented bedding or any commercial nesting material. These are extremely dangerous to gerbils. Make sure that your bedding or toys do not contain any strings of fibers. These are also very harmful and can lead to many problems. Boxes and Chew Toys: Gerbils need tons of toys and boxes. Any un-refrigerated food box is perfect for them. Remove all the plastic from the inside or outside of the box and check for the electronic security stickers. Uncoated paper plates also make amazing chew toys for the gerbils. You can fill a gerbil’s cage up with paper plates, paper towel rolls, and boxes to make a gerbil paradise. You can also place the food in the boxes for the gerbils so that it doesn’t touch their litter. I would only recommend buying wooden chew toys in pet stores if they are made in the USA. Food: We feed our gerbils Kaytee’s Hamster & Gerbil Gourmet Variety Diet. Two gerbils require 1.5 large handfuls of food per day. If you see your gerbil getting thin, add more food as needed. Do not monitor the food as a means of weight loss. Gerbils are supposed to be hefty and well-muscled, so never withhold their food. Water Bottles: Gerbils are natural desert animals, so they won’t drink as much as the average rodent. Because of this, their cages don’t generally smell bad between cleanings. However, a large-medium sized water-bottle is still highly recommended, because of the size of the gerbil. Never give your gerbils a water dish. These gerbils have never seen one before and since they’re curious by nature, they may inhale the liquid. Always have 1-2 spare water-bottles available at all times. Even the best made water-bottle has been known to leak or break. Change a gerbils water-bottle everyday, and check that it is working. The best way to check is by tapping your finger on the end to make sure that water is coming out. Vets: Gerbils are considered exotic animals. A lot of vets will not treat gerbils or charge extra due to their exotic rodent status. It is important to call the vets ahead of time and confirm that they will treat the gerbils. When bringing gerbils to the vet, bring all of their cage mates with them otherwise they will become panicked. You also risk de-clanning if you try to reintroduce them. While bringing the gerbils to the vet for serious conditions is always a smart idea, you also have to consider the risk that they will catch something while they’re there. Always thinking about the risks vs benefits before bringing your pet to the vet. Red Nose or Bloody Nose: Gerbils have red colored mucus, which can crust around their nose. It might look like a bloody nose, but if it is coming directly from their nose, there is a good chance that it’s just a runny nose. Just like humans, gerbils get colds too, and one of the most prominent symptoms is the runny nose. However, if the runny nose lasts for more than two weeks, it is probably an allergy. 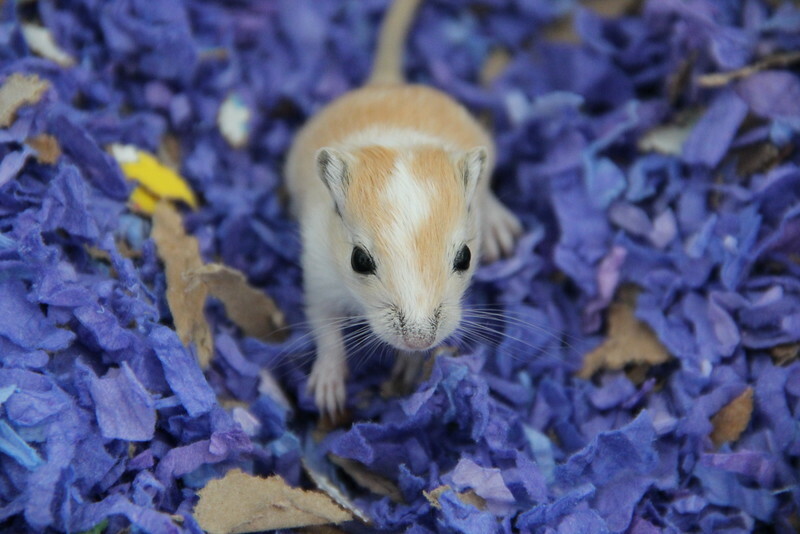 Gerbils can develop allergies just like humans, so you will have to figure out what is bothering them. Take out any new toys that have been introduced within the week prior to the runny nose. You can also try changing the litter to a non-allergenic brand such as Kaytee or CareFresh. If none of these methods work, you may want to consult your vet. Red Tears: Like the mucus, a gerbil will cry red tears. The redness is completely normal, however, it is most likely the sign of a cold or an allergy. As stated above, take out any new toys that have been introduced within the week prior to the runny nose. You can also try changing the litter to a non-allergenic brand such as Kaytee or CareFresh. You can also try wiping their eyes with a warm, damp cloth to remove any of the tears that might have crusted around their eyes. Do not wipe their faces unless you are capable of holding them completely still. An injury to the eye is much worse than a few tears. Bumblefoot: Bumblefoot is a painful sore that developed on the bottom of a rodent’s foot and can be crippling to the animal. Gerbils develop bumblefoot from living in wire cages or running on wire wheels. If you have a gerbil, it is necessary that their wheels and cages have completely solid floors. If these sores on their feet become infected, it can lead to many other painful symptoms, including death. Questions: If you have any others questions or comments, please feel free to ask us at anytime. Your gerbil’s well-being and health is our priority, and we want to help you become the best gerbil owner. Follow us on Facebook , Tumblr, and Pinterest for constant gerbil updates and pictures!